Artists have a tendency to collect things. Among other things, I maintain a modest collection of banknotes — bills, from all over the world. I keep them for purely aesthetic and inspirational reasons. I’m not interested in finding rarities or notes that are due to increase in value, in fact I have rarely paid for the notes I have. When a friend or workmate mentioned that they were visiting a foreign country, I’d simply ask if they’d bring me back one or two bills from that trip. Coins often came with the notes, but I’m just not as actively interested in collecting them. In these small piles of delicately detailed pieces of paper were slices of culture far more tactile than a mere mention in a textbook. Banknotes carry a distilled and encapsulated statement of nationality like nothing I’d experienced before. In touching them and studying their designs, I was captivated viscerally by their nature as objects. And that was it – I was hooked. Ever since then I have been trying to emulate that experience. I often sketched and drew my own paper money right up through high school. So, an important part of my collection is the homespun banknotes, the weird wonderful works created by individuals for art or politics. Some classic play money from about 1965. Creating art around money is nothing new. The trompe l’oeil artists have been painting banknotes for quite a while. The contemporary bad-boys of art such as Shepard Fairy, J. S. G. Boggs and even Banksy have riffed on the banknote themselves. In the Nineteen Nineties I discovered Adobe Illustrator. I have never taken a class in Illustrator. Rather I would assign myself projects such as creating my own fonts. Then, sometime in February of 1994, an idea struck me: What if I were to create my own money? Computers don’t make life any easier, but they sure do make it more reproducible. I realized I could make multiple copies with their own serial numbers! I jumped right in. I combined this old idea with my new computer skills and the first Phun note was created. Once I hit upon a size, I realized that a folded Phun note was roughly the size of a business card. By December, I had made them into business cards with two more denominations. I tested several different kinds of paper by printing and trimming a note and carrying it around in my pocket for a couple of weeks to see how it wore, and how the toner remained on it. By far the most durable paper I could find at the time was Crane’s Distaff Linen. It’s a wove paper that was available in a nice ivory color and had the weight and feel similar to some of the foreign banknotes in my collection. As we moved toward a more paperless society during the nineties, the variety of stocks to choose from began to lessen. By 2000, Distaff Linen had become a special-order paper, so I ordered a few reams of it and redesigned the One Phun note adding Photoshop and Bryce to the software toolkit and placing my phone number where the serial number would go. In 2003 during an anatomy and life drawing class, we were given the assignment of a self portrait. So, I redesigned the back of the One Phun Note and put my picture on the front. In 2005 I redesigned them again as a Three Phun note, and this was by far the most popular design. I have fewer than ten of these in my archive now. Then, while living in Atlanta in 2011, changes in technology forced another redesign – this time creating the first 4 Phun note (get it?). But I decided they would be a good platform to display more handmade art. Upon moving back to Boston, I discovered that most of Crane’s retail line had been given over to the Neenah Mill and they’re not making Distaff Linen available on a retail level. Recently I pulled my remaining stock off the shelf and created one more batch of Phun – this time completely for art’s sake. These are wholly original designs that took quite a number of weeks to complete. I have only carried over a few design elements that tie them together with previous pressings. I have created three denominations: 4, 9, and 31 Phun. 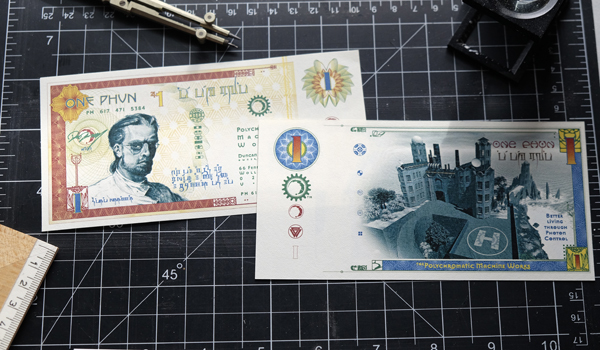 They are smaller than previous notes — about the same size as the Euro. I had to do this to save on my now dwindling paper supply. This is a limited-edition run of 1000. The serial numbers are consecutive in sets of three, one of each denomination. Can I ever get Crane’s Distaff Linen again? More research is required. I have enough for one more small run, and I am thinking about what I might produce. After 22 years, I feel like the possibilities for this kind of project are still to be tested… and there are still some fine papers out there.